Kota Kinabalu is a popular destination with tourists and it is the capital of Sabah state in East Malaysia. The city is served by Kota Kinabalu Airport, which is located about 8 km southwest of the city centre. This beautiful city is located on the northwest coast of Borneo opposite the South China Sea. The city is visited by thousands of tourists every year. It offers something for all age groups and is full of tourist attractions. Opting for car rental makes a great deal of sense as it is so convenient. Kota Kinabalu is well known among tourists for its beautiful beaches, historic buildings, museums, art galleries and parks. Major attractions of the city include the Filipino Market, Kota Kinabalu Waterfront, the Atkinson Clock Tower, Kota Kinabalu Wetland Centre, the Green Connection Aquarium, Monsopiad Cultural Village, Tanjung Aru Beach, Sabah State Museum and a lot more. You can also find a lot of hotels and restaurants in the city, so food and accommodation is never a problem here. Car hire has many benefits for tourists and a vehicle can easily be collected from the airport when you arrive. The Atkinson Clock Tower, built in 1902, is one of the most popular attractions of the city. It is dedicated to the first district officer of Jesselton (former name of Kota Kinabalu). The Filipino Market is a fantastic place to buy cultured pearls, handicrafts and souvenirs as well as ideal for those who want to meet some of the locals. The Kota Kinabalu Waterfront offers scenic views of the sunset. You will also find a number of bars and restaurants here. The Marlin Statue is located in the heart of the town and is a beautiful place to take some nice photographs. The Kota Kinabalu Wetland Centre is a great place for nature lovers, where they can witness mangrove wildlife. The Green Connection Aquarium is a great place in the city to see a large number of aquatic animals including sharks, snakes, turtles and many others. 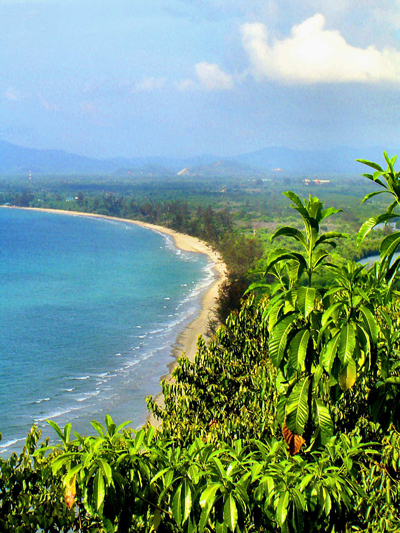 Tanjung Aru Beach is the most popular public beach in the city, where tourists can enjoy a great time with family and friends. Tunku Abdul Rahman Marine Park, City Park and Lok Kawi Wildlife Park are a few notable parks of Kota Kinabalu. The Sabah State Museum will definitely be a favourite among history buffs, which tells of the history of Kota Kinabalu and Sabah in an impressive way. The Islamic Civilisation Museum, the Science and Technology Museum and the Sabah State Library are a few sites which are worth a visit. Car rental is a must in this area as there are also many sites outside the city which are worth the trip. A vehicle can be reserved online and waiting for you when you arrive in the city. Rentalcargroup.com compares car rental prices for Kota Kinabalu Airport). We work with many car rental companies so the quality of the cars is guaranteed. This way you will be sure to get a rental car that suits you the best and for a competitive price. Most major car rental agents in Kota Kinabalu Airport offer one way rentals. One-way rental is when you collect the car in one place and return the car in another location. In most cases the car rental agent will charge an extra fee if you wish to return the vehicle at a different location. In the terms and conditions will state if the one-way fee is included in the rental price. If the one-way charge is not included in the rental price, the one way charge needs to be paid on arrival directly to the car rental agent. Rent a car can vary a lot. Rentcargroup.com is one of the largest independent rent a car brokers, the global purchasing power allows us to offer you the best car rental deals. For each occasion there is the right car for your choice. Small, cheap or exclusive vehicles; there will always be a car of your choice. In Kota Kinabalu Airport, many car rental companies offer different types of cars, from small cars to large SUVs. Rentalcargroup.com has made it easy for you. Simply filter the results. If you are looking for an SUV, click SUV and you will see all the SUVs you can choose. You can also see if the SUV is a 4 * 4 guaranteed, because not all SUVs are guaranteed 4 * 4. If you want a guaranteed diesel car, use the search filter and you will have the guarantee that you will get a diesel car. Last month, the average car rental length at Kota Kinabalu Airport was 3 days. The average rental car length at Kota Kinabalu Airport is 3 days. The most booked rental car type currently at Kota Kinabalu Airport is ECONOMY cars. Last year, the most booked rental car type at Kota Kinabalu Airport were INTERMEDIATE ELITE cars. How much does it cost to rent a car at Kota Kinabalu Airport? Last month, the average car rental price was 110 USD. Last year, how much did it cost to rent a car at Kota Kinabalu Airport? Last year, the average car rental price was 166 USD. What is the current average daily price to rent a at Kota Kinabalu Airport? Last month, the average rental price was 39 USD per day. How much did it cost to rent a car at Kota Kinabalu Airport over the past 12 months? Last Year, the average rental price was 52 USD per day. The car rental companies available at Kota Kinabalu Airport are: . See below last 5 customer reviews. Our customers rated Kota Kinabalu Car Rental with an average of 10.00 based on 1 ratings. Deposit On Cresit Card, It Was Safe. Car rental companies in kk,sometimes not refund your deposit.